While I knew our process to design and drive high performing cultures worked within business organizations, could it work with a small group of fourth and fifth grade girls? This was the question I asked myself when I decided to “test” our process with my daughter’s youth recreational basketball team. Admittedly, I had my doubts. Could these nine and ten year old girls grasp the meaning and importance of the process? Would they care? At this age, it could be difficult to simply maintain their attention for the duration of a one-hour practice session, let alone try to make meaningful change to the team culture. Yet, the team’s response surprised me. Not only did the girls “get it”, they thoroughly embraced it. My approach was almost identical to the one we take with our clients. As coach, I first identified those behaviors (we call them Fundamentals) most critical to the success of our team. When I defined success, I was not thinking about wins or losses. Rather, I considered those behaviors that would lead to effective teamwork, making contributions and maintaining a positive attitude. Some of our Fundamentals included “Be a good teammate,” “Hustle on every play,” and “Look for ways to contribute.” These were skills that I knew would benefit the girls long after their days of rec basketball were over. Once I identified those behaviors, I established a few “rituals” to provide repeatable opportunities to communicate, coach and reinforce these behaviors. We focused on one behavior each week. We began every single practice and game with a brief discussion of that week’s Fundamental. In these discussions I would let the girls tell me why they thought that week’s Fundamental was important. When I saw one of the girls actually practicing one of the behaviors, I would make a very big deal of it with the other players. 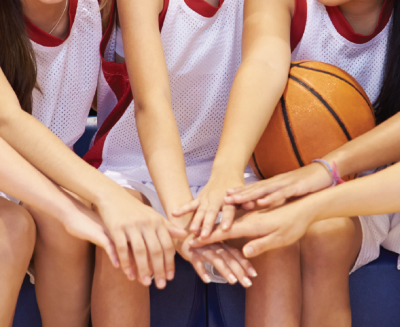 We created team goals that every girl could contribute toward, regardless of their basketball skill level. For example, we might track the number of loose balls recovered, or our total rebounds per games. The girls’ response to the program was intense and immediate. By week two of our season, the team would not let me start a practice or begin a pre-game talk until we first discussed that week’s Fundamental. Some days, I barely could make it into the gym before they were shouting to me, wanting to know what that week’s Fundamental was. After a few weeks of this, a funny thing started to happen. The girls took ownership of the process. As importantly, they started to live by the Fundamentals. Our most skilled players displayed amazing leadership and became mentors to our less skilled players. Our less skilled players became more confident as they could see that there were a number of ways they could contribute to the team. Interestingly, we won a bunch of games in the process. Parents and league officials noticed the impact of the process. In fact, there was so much positive feedback, the league decided to implement our Fundamental process league-wide (See video). It’s incredibly fulfilling to see the impact the process is having. Here’s my takeaway from all this: For any organization, if we clearly define and articulate those behaviors that are most critical to our success and establish rituals to practice those behaviors over and over again, we can significantly elevate how we perform- even with a group of nine and ten year old girls!